Last November, Gary introduced a product to me called Routearrows (find a complete description at routearrows.com). 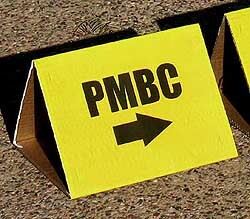 We are always seeking new and better ways to mark the course for PMBC’s Casa Grande Century (CG100) ride. The CG100 is routed primarily along farm roads south of Queen Creek and east of Casa Grande. Since these roads see sparse traffic, I decided that applying routearrow test samples onto my driveway would be a conservative assessment, likely to be run over at least 5 or 6 times a day by my truck and SUV. I instructed my wife and son to deliberately steer and run over them on each entry and exit. The markers were placed to receive a full day of sunshine on sunny days. I took photos of one of the markers frequently at first, but spaced out once I realized the disintegration would take a while. Click on any photo to see it in closer detail. Total of 1.51″ rain, pretty normal for winter months in desert Arizona. The traffic loading in my driveway was probably lighter than a farm road, and so this is a conservative test. You can readily see that the color gradually fades out over the 8 week timeframe. The arrow shape stays completely intact while the surface of the paper roughens. The contact adhesive became very weak after about 6 weeks. By the 8th week, all of the test samples had come loose and blown off my driveway, to be found in the bushes. To reiterate the vendor’s claim: “If they stay dry and see very little traffic, it can take up to 6-8 weeks until they’re completely gone.” I found this statement to be false. Over this 8-week test, only the color was “completely gone,” while the arrow itself was still quite a thick slab of paper that had barely begun disintegrating. My conclusion from this 8 week trial is that, for purposes of the CG100, these markers would have to be removed following the event. Leaving them down will potentially draw unwanted attention from ADOT or the county due to the slow deterioration. More importantly, the soon-to-detach arrows disintegrate slowly and therefore represent trash to the surrounding environment. On January 22, 2011, I rode our club’s Mummy Mountain route and noticed that an event ride had very recently used and left red Routearrows on a course up there. The arrows are nicely visible and not a distraction for motorists. We will plan to monitor these markers over time when the club returns to this site (likely in March 2011). Weather Resistance – Good enough for 1-day event, or longer depending on conditions. Clean up – Based on the exposure tests above, event staff should remove Routearrows following an event. This finding is not a huge shortcoming, but it does discredit the vendor’s claim that Routearrows do not require clean-up. They do. Cost – The CG100 would require about 300 arrows at a cost of around $100/event. Existing CG100 cardboard marker - front face is about 8.5" x 11"
As a member of the Friends of Folsom Parkways who support bike and pedestrian trails in Folsom, California, I would like to contact Rich Torkington, the author of the routearrow review. We have printed references to Rich’s article in our newsletter. I would like to establish direct email with Rich to follow up on this issue.